Now that Fellani has gone, I expect to see a lot more of him when we are trying to take off a midfielder when leading comfortably. Is good with his head as well and does the simple things well. His basics are good while also handing out goals and contributing nothing in attack. How is that something to be impressed by? Aye. If Fellaini had stayed Scott would've likely gone out on loan. Now he's gone, Scott gets a chance to fight to be 4th choice mid. He doesn't hand out goals. Im done talking with you, your agenda is clear. Looked assured today. Nice cameo. Couple of decent touches and almost scored a header, decent cameo. Not good enough, but have no issues about him getting games in matches like today. What other choice is their ? He is our only option if one of the other 3 get injured. To be fair today he made a brilliant challenge and laid in a cross that if Lukaku wasnt a gormless donkey should have been in the back of the net. I've not been a fan so far, but today he did a reasonable effort in 20 minutes. At the moment, he looks a more sensible option than Fred or Pereira. That was clear from the Reading game, never mind today's 17+ mins. Absolutely no problem with him coming on to kill games like this one. Think the Pereira bandwagon is dead and people can judge him a bit more objectively now. He made mistake but he didn't look out of place playing against their ( Liverpool , Chelsea , Sevilla ) quality players. Meanwhile certain Brazillian were schooled by Reading midfielder. You should try to appreciate simplicity , steel , awareness , positioning , discipline and composure more than meaningless flair & dribbling , then you will start to see why both Sir Alex and Jose Mourinho rate him. I am glad Ole can see it too. 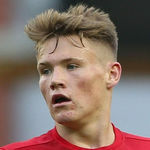 Quite frankly, McTominay was a pleasant surprise today. Certainly he didn't put the world alight, but still his 20 minutes tenure was a very decent performance by all standards. He contributed to attacks, he had a chance to score with the header, he didn't allow himself to be bullied by opposition - on the contrary, he tried to help win the ball back when need be. We haven't seen Fred yet in a strong midfield, but at the very least this performance of McTominay was light years ahead of the last performance by Pereira - hence Scott climbs up the ladder in the pecking order. We really, really need some depth in midfield to be able to use rotation or substitute players. With Matic not in the travelling squad for Liverpool think it'll be Scott who gets the nod. Hopefully he can play similar to how he did last season vs Liverpool. Yeah I think it’ll be him or Fred, tempted to say Fred to get him minutes ahead of PSG. I’d rather McTominay. He’ll bring passion and fight that’s needed for this game. It's tricky. On one hand McTominay brings fight. On the other hand, he's the most susceptible to losing the ball from their pressing. Fred hasn't exactly shown he's resistant to press for us either tbf, quite the opposite actually. Yep. He's struggled here. But in theory that's what he's supposed to be better at due to being better technically. Fred looks like he will lose the ball without anyone even pressing him. Yeah. Either way the option weakens us. A career defining game coming up for the young man, I'm not his biggest fan but am firmly in his corner today. Well, if he wants to make a claim to be a long term option in this squad, now's a good a time as any. This is what squad players are for, if he can’t step up today he has no place in this squad, it’s as simple as that. Not really true, as last choice he could be someone who comes in for the easy games. McTominay must channel Phil Neville v Arsenal (h) in 02/03. I have the same feeling. The game usually passes by him. Doesn't have any positional sense and isn't great at tracking players. He is our biggest worry in the game. Shame that Fred or Pereira haven't shown Ole enough in training to step up to the plate when needed. Pogba and Herrera will have to be up on their game today and put on massive defensive performances. Brilliant out there for his first start in a while. Such a brilliant performance. On the back of that Matic has a challenge getting back in the team. He was everywhere and did everything right. Did the job pretty well down there. Well done.